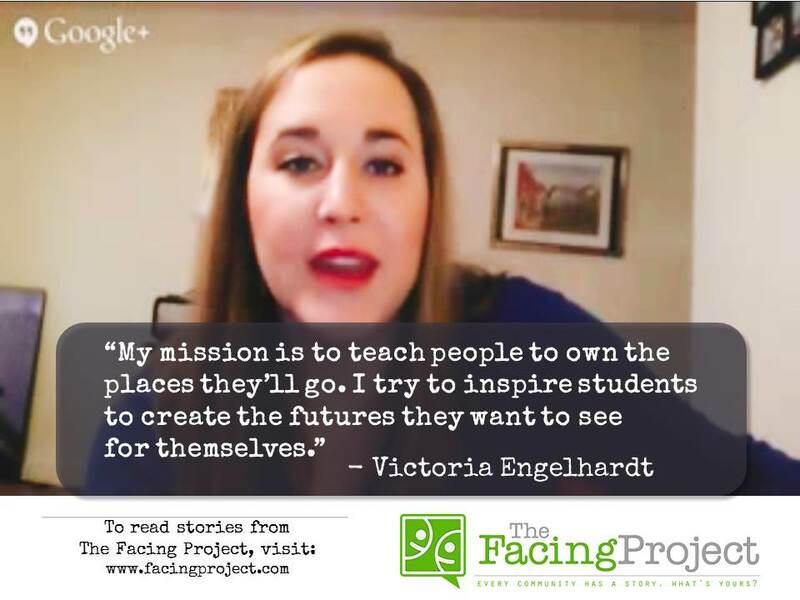 At the beginning of January, we started a live video chat series called “Facing Stories.” Twice a month we’ll Google Hangout with experts on writing, empathy, community engagement, and more, and we’ll explore techniques, trends, and the overall power of storytelling. We’ll also share the stories and lessons from those who’ve participated in Facing Projects. On January 15th, I sat down with writer Victoria Engelhardt from Facing Addiction in Knox County, Kentucky: It’s Our Move to discuss her role as a writer and educator. Victoria lives life with a mission of going beyond teaching to being a mentor who shows students what’s possible and how they can give back. As a high school English teacher through Teach for America—an AmeriCorps program that deploys teachers to disadvantaged communities—Victoria was able to illustrate how to give back when she sat down to capture the first-person story of one of her students for Facing Addiction. The story, “I Stopped the Cycle: Rebecca’s Story,” explores life through the eyes of teenager who has grown up in a small town with addiction all around her; yet she refuses to allow her environment to define who she is as a person. Victoria indicated that writing Rebecca’s story helped her better understand the struggles encountered by today’s teenagers and it strengthened the relationships with her students. Because the stories come from Knox County, she uses Facing Addiction in the classroom as a way to create open dialogue among the students about issues they face and those discussions provide insight into how she can inspire and motivate her students to seek their best futures. Since sharing her story with Victoria and participating in Facing Addiction, Rebecca has been accepted to 20 colleges and universities and she received the Golden Compass Award for writing. Recipients of the Golden Compass Award are asked to pay it forward and choose one person in their life to recognize who has provided them with inspiration–Rebecca chose Victoria.